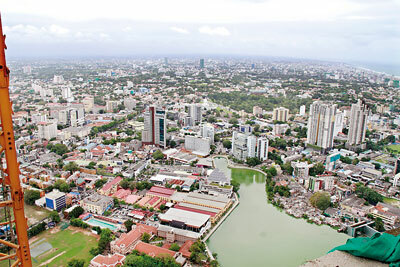 In Colombo’s fast changing skyline, one structure that stands out from the rest is the Lotus Tower. 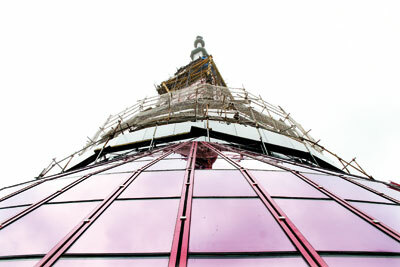 Standing tall at 350 metres, the Tower which will primarily serve as a transmission station for television and radio is slated to open in March next year. 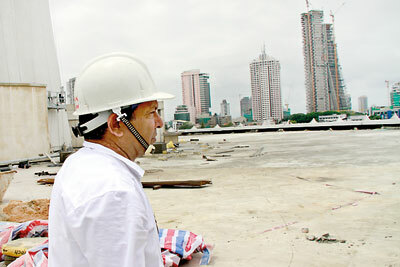 It has taken both Sri Lankan and Chinese experts from various fields to overcome the challenges faced when constructing a massive structure like the Lotus Tower, the total building area of which is 26726 square metres. The project’s Resident Engineer Kithmal Perera said some of the major challenges at the onset of the project in 2013 were the excavation of the bed rock and concreting the structure; work done with expert advice from professors at Moratuwa and Peradeniya universities. “We had several professors from the universities actively involved in this project. We gained a lot of new knowledge and also imparted them to young engineers,” Mr. Perera said. The Lotus Tower is divided into four parts– the tower base, tower body, tower house and the mast. The area at the base of the Tower consisting of three floors will be used for commercial purposes while a telecommunication museum, an exhibition hall and a visitor centre are also planned for the area. The Tower House in the shape of a Lotus flower, with 32 petals, will have radio and television transmitter plant rooms and control rooms on its first and second floors while the third and fourth floors will include two banquet halls. The fifth floor will have a revolving restaurant, the sixth rooms for state guests while the seventh floor will be an observation deck. Topping off the tower is the 150 tons steel mast. “The mast has been designed to withstand wind and earthquakes while fire safety too has been given paramount importance,” Engineer Perera said. For the China National Electronics Import and Export Corp. (CEIEC), the Chinese contractor for the Lotus Tower project, this is the first overseas tower of this magnitude undertaken. Cai XIaofeng, the Project Manager for the Lotus Tower said despite teething problems the work is progressing to schedule. “When working at such high altitudes, bad weather often hinders work and can lead to delays but we are on track to complete the work by March next year,” Mr.Xiaofeng said with confidence. 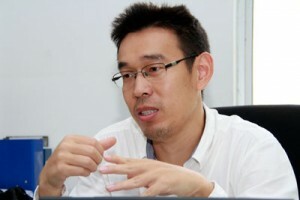 He said that most of the fire safety mechanisms in place in China have been introduced to the Lotus Tower. 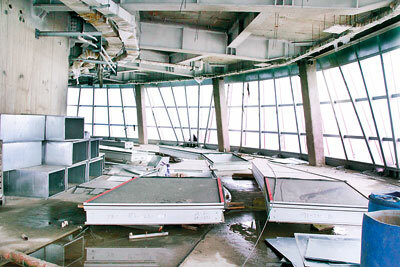 “We have many such towers in China so we have a lot of experience in the safety of such buildings,” he said. The Chinese employees are responsible for the most challenging aspects of the building work; such as hoisting the mast and work on the curtain wall made of glass and aluminum. However he added that Sri Lankans too are engaged in much of the operation of equipment with many trained to undertake the difficult work. Administrative Manager of the Lotus Tower Colonel Chanukah Abeykoon said once completed it is likely to attract a large number of visitors. “On a clear day you can even see Sri Padha (Adams Peak) while the view all around is breathtaking. It will attract a large number of visitors,” he added. The US $ 104 million project was commissioned by the Telecommunication Regulatory Commission (TRC) of Sri Lanka in 2013.